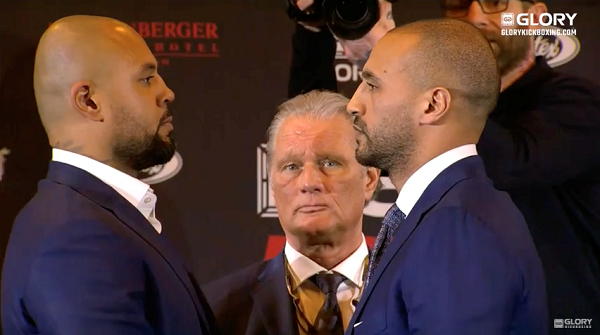 AMSTERDAM – With unfinished business stemming from their unforgettable first fight nearly eight years ago, heavyweights Badr Hari and Hesdy Gerges will finally meet in the ring once again. Their long-awaited rematch headlines GLORY 51 Rotterdam, from Rotterdam Ahoy in the Netherlands on Saturday, March 3. Earlier today, GLORY hosted a press conference in the Netherlands where the rivals answered questions from the assembled media and squared off for the first time ahead of their highly anticipated bout. Tickets for GLORY Rotterdam (including access to GLORY 51 SuperFight Series) are on sale now and can be purchased at tickets.glorykickboxing.com.